Posting on the phone again and all is well in Lloyd. I slept well and Maurice slept cuddled up to me all night. The night before she slept on Mr. Moon all night and even though he was appreciative of her affection he doesn't enjoy her cuddles the way I do. I think she missed us. I just got back from my walk and it wasn't very long and it wasn't very fast but it was a walk. Not much has changed in the last week on the back roads of Lloyd. The swamp mallow is blooming profusely and I was interested to read in South Moon Under that it was referred to as "marsh mallow". Maybe tomorrow I'll try to dig up a piece to plant here. A not-so-tropical hibiscus that does not have to be brought in when it freezes. I need to get out in the garden and pull the spent tomatoes and bug-eaten squash. The watermelon and cantaloupe I planted are slowly but inexorably taking over the entire plot like a slow motion wave spreading across the beach. That would be fine if I saw any fruit at all in the vines but I do not. Mighty healthy looking vines though and they are curling their slender tendrils around the zinnias and crowder peas. Perhaps something will develop there and for now I will leave them be. I feel good today. Strong enough and content to be home. 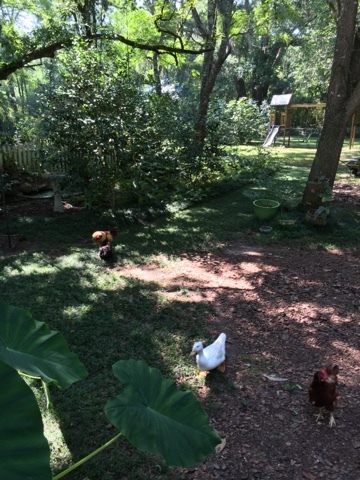 My chickens cluck in the yard, Mick doing his rooster duty, stopping his scratching every few seconds to stretch his head up and looking around to check the area for possible threats. I need to go to the grocery store. I was grateful last night for those delicious little bream to fry and I made a salad of the last of the tomatoes with green beans and edamame beans and corn and onions and peppers and it was delicious. It is good to be home and how incredibly fortunate I am to have a home which is so sweet to return to. I have been thinking a lot about what it is that makes a life truly worth living and I have reached the conclusion that the answer to that is simply love. Love given and love returned. Love for a lover, a partner, a spouse. For children and grandchildren. For friends. For the place which one lives. For work if it is satisfying. One could have every damn thing on this earth but if there is no love shared, I cannot see how there can be happiness and dare I say? Even meaning. Love can come in so many forms. It is that which sustains and fulfills us. It is that which can direct our steps and actions every day. And should never be taken for granted. May you know much of it. Yes, love can come in so many forms. I am glad to have love from a few people and love them back fiercely. yes indeedy. may all our lives be filled with love and contentment. i think you are exactly right about love. I agree. All you need is love. As four boys once sang.